REPUTATION AUSTRALIA TOUR SYDNEY – FRIDAY 2ND NOVEMBER 2018.
before 20th October 2018 to be in the draw to win! 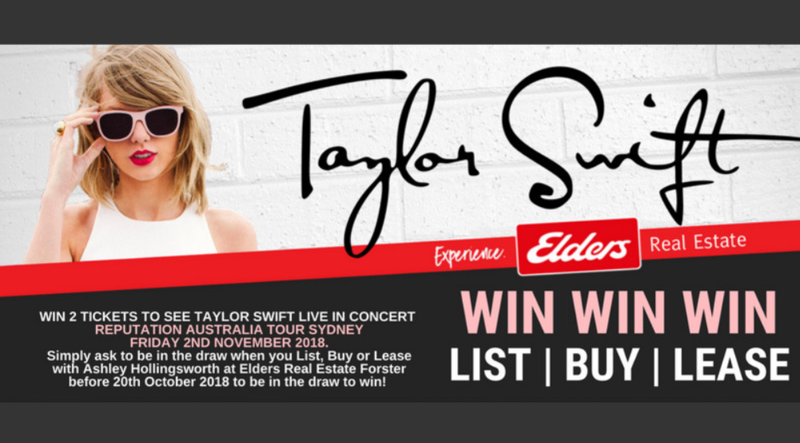 Simply Like, Share & Ask to be in the draw when you List, Buy or Lease with Ashley Hollingsworth at Elders Real Estate Forster before 20th October 2018 to be in the draw to win! Additionally if you know anyone thinking of selling simply refer them to Ashley to also gain entry. Terms & Conditions Apply – Tickets will be drawn 5:00pm Saturday 20th October 2018. Contact Ashley @ Elders on 0447 10 77 44 today to be part of this awesome giveaway. • Prize is 2 x tickets for Taylor Swift Reputation Australia Tour Sydney on Friday 2nd November 2018. • Winner drawn on 20th October 2018 at Elders Real Estate 11 Wharf Street Forster NSW. • Winner notified on Facebook and by telephone if number is available. • If the winner cannot be contacted by 5pm on 21st October 2018 the prize will be redrawn. • 3 entries per person when you list your property For Sale with Ashley Hollingsworth at Elders Forster between 1/9/18 – 20/10/18 • 2 entries per person when you buy a property from Ashley Hollingsworth at Elders Forster between 1/9/18 – 20/10/18 • One entry per person when you lease your property through Ashley Hollingsworth at Elders Forster between 1/9/18 – 20/10/18 • 2 entries per person when a person you refer to Ashley Hollingsworth at Elders Forster lists their property For Sale or For Lease between 1/9/18 – 20/10/18 • Maximum 10 entries per person.